CORVALLIS, Ore. – Yellowjackets zeroing in on your steak and fruit salad as you dine al fresco can be irritating, but don’t get out the pesticide yet. It's easier to deal with these wasps if you know how they live. 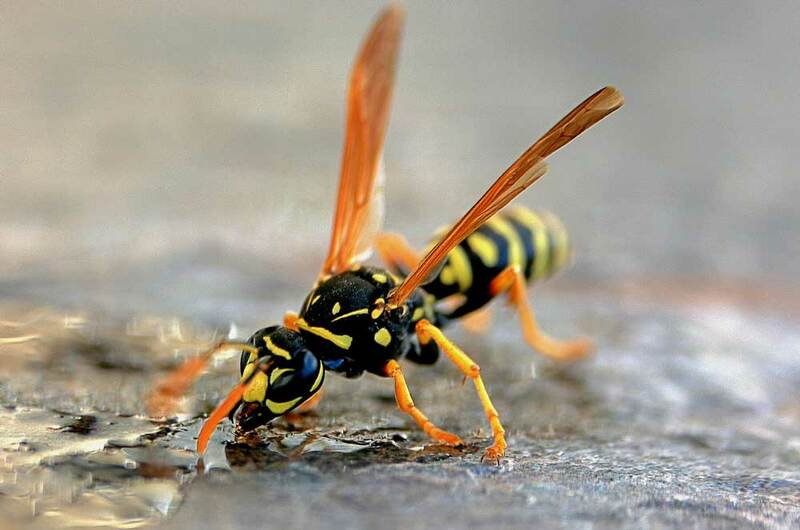 Yellowjackets are heavy-bodied, with black and yellow or white markings and live in gray, papery nests, which are mainly located below ground but some are suspended above. Worker yellowjackets hunt for insects, carrion or rotting fruit to carry back to the nest to feed their nest-mates. If you accidentally come close to or contact a nest entrance, you're likely to get stung. Workers vigorously defend the nest and queen. Their sting is more painful than honey bees and normally no stinger remains in the skin. A single yellowjacket may sting more than once. By fall, yellowjacket nests have produced a crop of new queens and males. By the first frost, most workers and queens leave the nest to find a protected spot to spend the winter. They emerge in spring to begin the cycle again. Only new queens survive the winter, however, and they almost never reuse the previous year's nest. Don't pour petroleum products into ground nests. It is dangerous, environmentally harmful and illegal. Use products specifically made for yellowjacket control only. Be sure to read and follow the pesticide product label. Remember, the label is the law. Other wasps are mud daubers and paper wasps. Mud daubers collect bits of wet soil to take back to their nests, usually a mud tube. Paper wasps build small, open nests that are suspended vertically from a horizontal surface, such as under an eave, bush or tree branch. Their long legs and thin "waists" distinguish paper wasps. Both mud daubers and paper wasps are less aggressive and normally will not sting or swarm when away from their nest.